The Vuelta a Andalucía (Tour of Andalusia) or Ruta del Sol (Route of the Sun) is a regional Spanish road bicycle race first held in 1925. Since 2005, it has been a 2.1 category race on the UCI Europe Tour. The nickname, Ruta del Sol, is in reference to the region's popular tourist coastline the Costa del Sol. 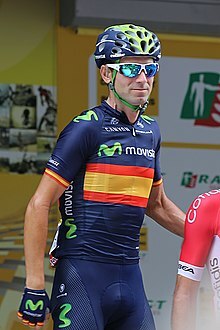 Alejandro Valverde (pictured at the 2015 Tour de France) has won the race five times. ^ "Vuelta a Andalucía". Cycling Archives. Retrieved 7 February 2016.